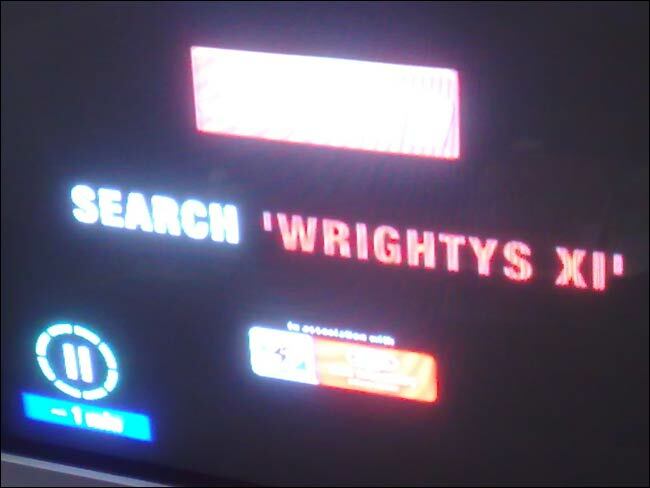 I don't know if it is a genuine first, but The Sun's current campaign for their 2010 FIFA World Cup Wrightys XI competition is the first time that I've noticed a national newspaper using search keywords as their main marketing call-sign on a TV advert. At the time of writing - 16:00 on 27th February - The Sun had an advert and the top organic slot on Google for the phrase, plus adverts on the UK versions of Yahoo! and Bing. They hadn't though, covered off searches for 'Wrights XI' or 'Wrights 11', which mostly seem to return advertising industry news about the campaign, rather than the competition itself. 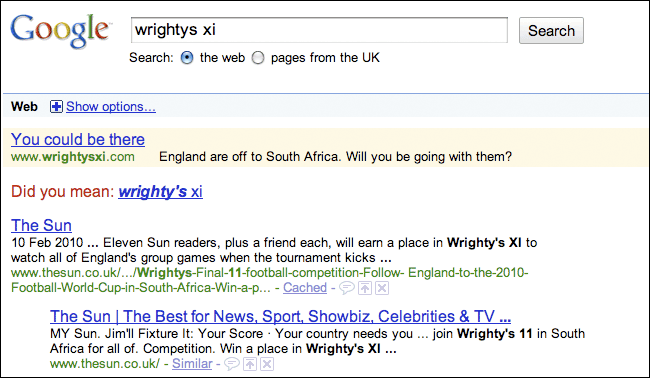 They also don't have any presence when you search Facebook for 'Wrightys XI', even in the Bing web results that appear on that page. I suspect search on Facebook may become an increasingly important channel for this sort of campaign. There is something else to consider though. Does it seem odd to you that The Sun's marketing people are pushing people to find their stuff on Google and Yahoo!, and paying for direct search marketing on the very websites that their proprietor described last year as 'stealing their copyright'? By Martin Belam on 27 February 2010. Not really surprising - Rupert Murdoch is a pragmatist not an idealist and he'll go where the best commercial advantage is. News Corp does plenty of business with Google where it suits them. The Sun website's own internal search is provided by Google and there are AdWords slots all over MySpace, just for starters. What I find more bizarre is that such a strong brand as the Sun would bother with this at all. Why not just direct people straight to The Sun site and on from there? It's a much more memorable phrase (and surely XI is more cricket than football? Might be unfair but I doubt Ian Wright's grasp on Roman numerals). The Government do the same thing on Act On CO2, paying for a middleman when they could just register and promote a decent domain to begin with. I agree with James - I think it is an accurate reflection of capitalist pragmatism. And, I agree with James on the bizarre drive toward a search engine vs. their own website. There are lots of variables on a search engine - the most dangerous is an introduction to your competitors! Oh well - we'll have to monitor this to see how it turns out (like does the campaign continue). I submitted an FOI request to Direct.gov.uk last year about their use of paid search advertising and it seems it cost them £2m over the last two years.